Steampunk splendidness, fun frivolity and mayhem. Bringing a smile to your face soon. On Saturday 28th March over 100 keen splendid punters hustled and bustled up to Thistle Hall on Cuba St, with a simply splendid array of finery, frippery, decorated teapots and bribes for the Judges. (I will discuss the fine art of bribery in another post.) The range of ages was preschool to gold card recipients, all magnificently resplendent and from as far flung places such as Weymouth, UK. 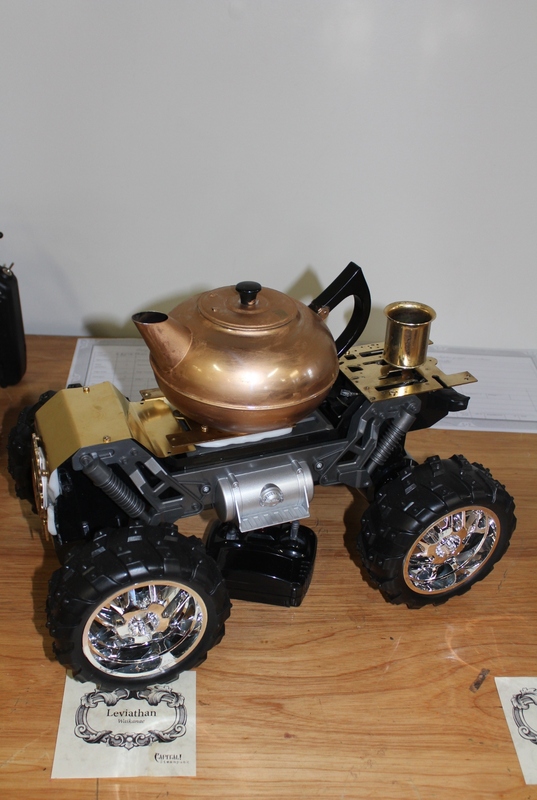 Eleven Teapot rigs were present, correct and cleared for take off. It was great to have Capital! 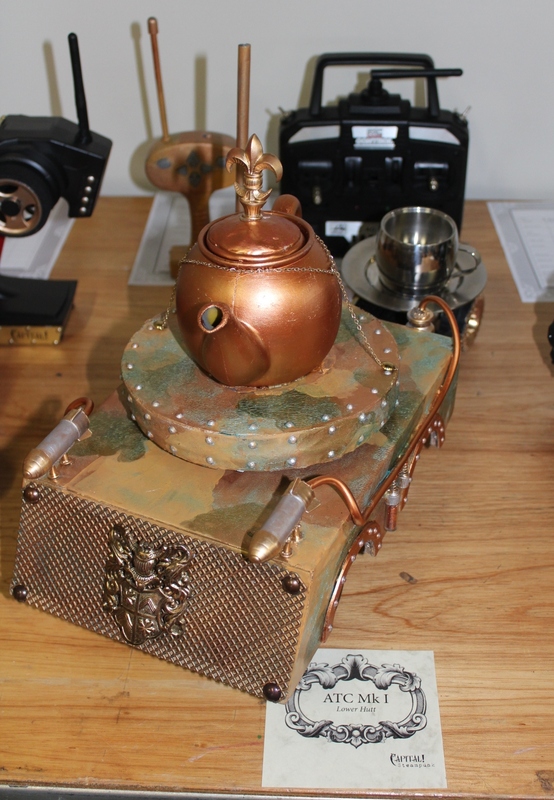 Steampunk NZ organize this event – my grateful and heartfelt thanks to Mrs Hudson and the Colonel. Thank you every one for your supreme efforts, the elegant turn out, splendid rigs and not least all you fine splendid people who travelled from the ends of the earth to be in attendance to support this event. The laughter, ooo’s and ahhh’s, the looks of horror and suspense on the faces of the attendees spoke more than my words can convey the delight and enjoyment of everyone present. I just have to say that the Captain and I had so much fun and hilarity at the Wellington event I just can’t wait until Oamaru. In fact I was allegedly laughing so much at one point that may be or maybe not, I can’t really say for sure, I missed some fine booting of the rigs and not recording a few out of bounds and knock over’s. It was also entirely possible that I nearly abducted a small child to join the circus that is presumed to reside under my spacious crinoline. Huzzah Huzzah Huzzah!!!!!!!! My right hand man – very clever he is. 2.30, Too many Did not complete all obstacles – a lot of ladylike booting of the rig with a very fine foot. had a lot of assistance from the foot. Splendid Teapot Racing was one of those, "will I get committed for this..." thoughts in the middle of the night but wouldn't it be FUN. 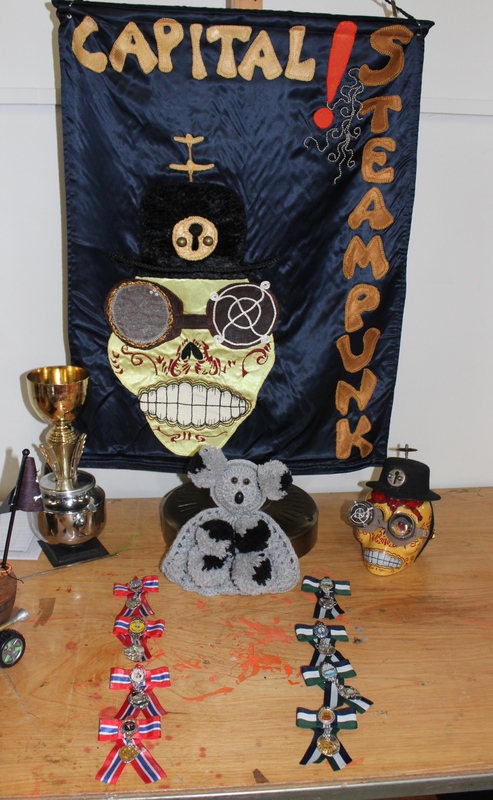 I submitted the idea to SteampunkNZ Festival as concept and in conjunction with them, in 2014 I ran the very first Splendid Teapot Racing event EVER held in the World at Oamaru. 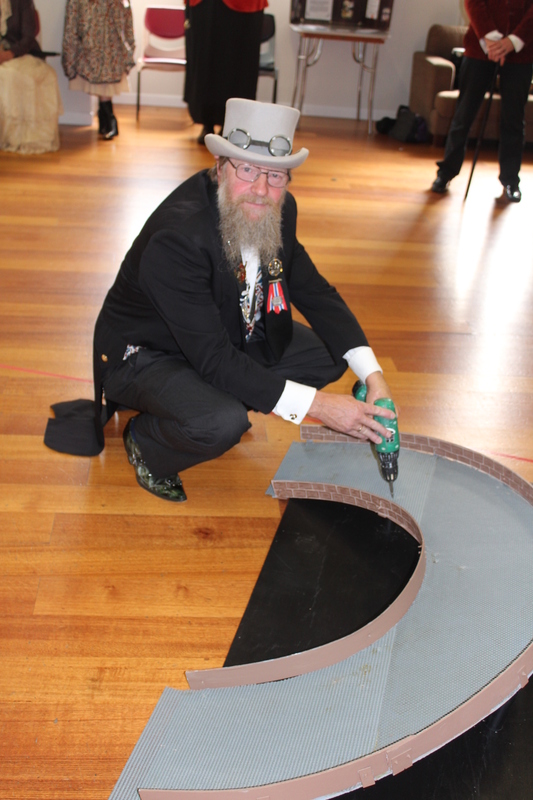 Of course it wouldn't have happened with out Captain Various Miscellaneous Bitsandpieces (Norm Riley) making the course! It was a night of mayhem, hysterics and fun. 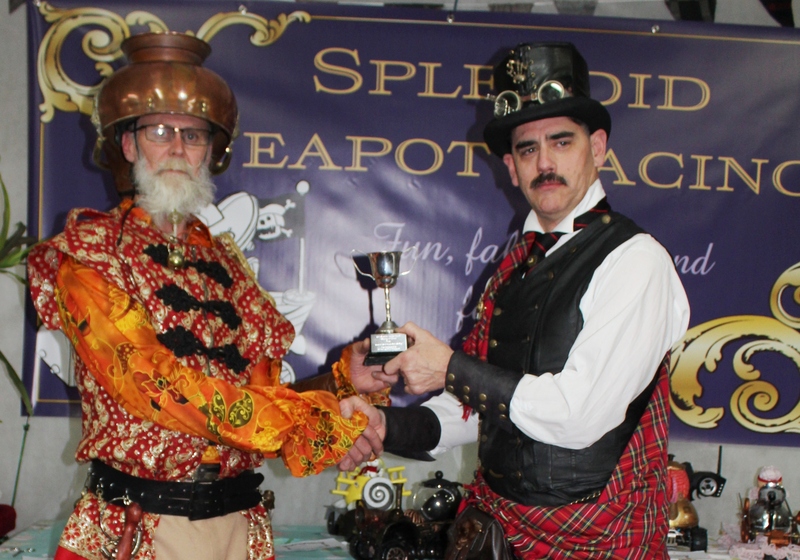 Splendid Teapot Racing is inclusive, for all ages and skills levels. It is about participation and having a jolly splendid time.